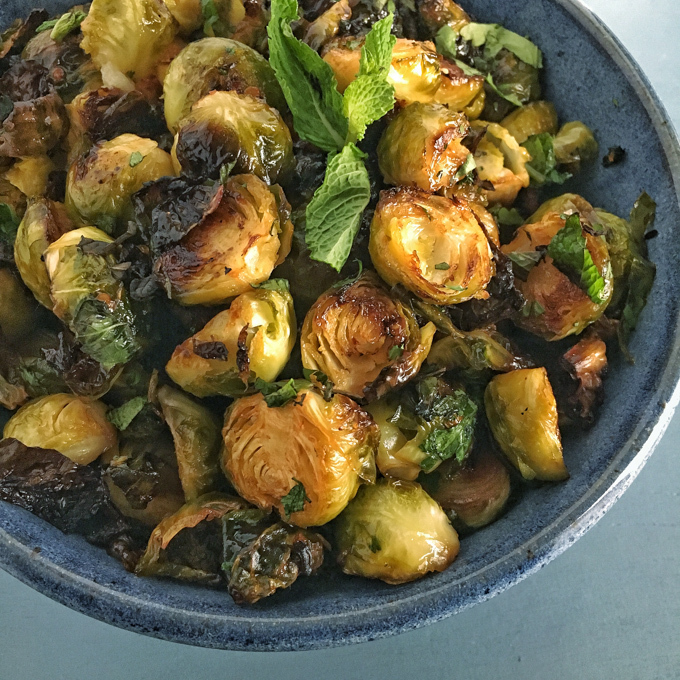 Sweet chili sauce, fresh cilantro and mint will take your roasted Brussels sprouts to the next level of crave-ability! Last month, my husband and I got to go on an all-day “adult playdate” with my cousin and her husband at the Jersey shore. We set the kids up with a sitter and headed to Cape May for the day. On the way home, we had dinner at one of their favorite restaurants in Margate called Steve and Cookie’s. My cousin insisted that we order the Thai Chili Caramel Brussels Sprouts to share. What I love about this recipe is that it’s really simple to make while the sweet chili sauce and herbs give it a powerful flavor punch. 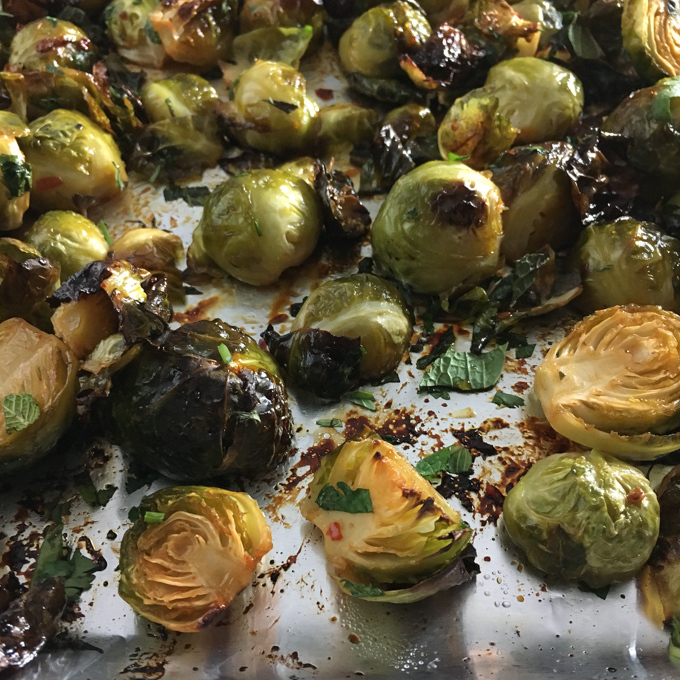 And of course, roasting Brussels sprouts is one of the best way to serve them – especially if you have folks who don’t think they like them—-> which was Serena and me until a few years ago! Sweet chili sauce, fresh cilantro and mint will take your roasted Brussels sprouts to the next level of craveability! Preheat oven to 400 degrees Fahrenheit. Cover two large baking sheet pans with aluminum foil. In a large bowl, toss Brussels sprouts, chili sauce, oil and salt. Toss with 2 tablespoons of cilantro and 2 tablespoons of mint. Spread out onto baking sheets and roast for 15 minutes, stir and then roast for another 10 minutes. Mix in remaining herbs and roast for another 5 minutes or until sprouts are crispy on outside and tender inside. 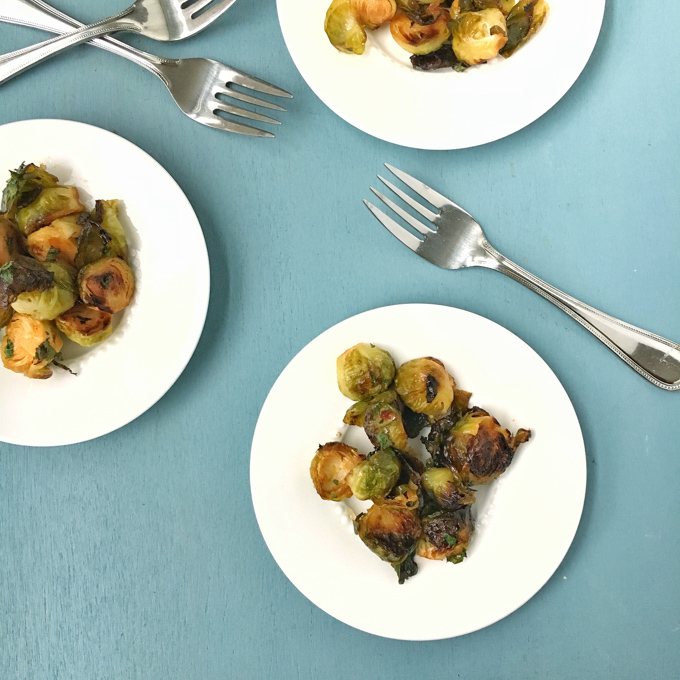 And if you need more convincing to jump onto the I Love Brussels Sprouts bandwagon, check out Serena’s tips in these posts: How to Like Brussels Sprouts and How I Got My Kids To Like Brussels Sprouts. Love Cape May, and Brussels! And I can probably get the hubs on board to eat them when I tell him they are thai! If he loves Thai food, then he has to at least try them 🙂 We were hanging out at Cape May Winery that day – SO fun! Yep. All over this recipe! I’m actually trying to grow Brussels sprouts for the first time right now too! That is TOO cool! I never knew how they looked as a plant until I saw them in Trader Joes’s few years back on the stalks. LMK if you are successful! I’m on my third batch this week!! 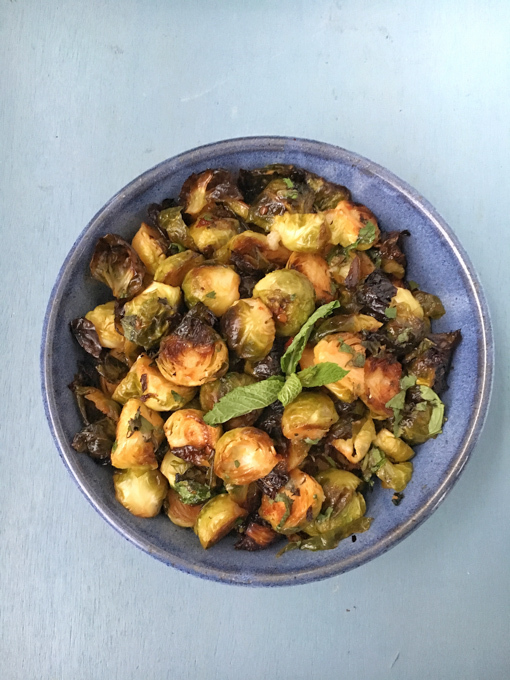 I’m a HUGE fan of roasted brussels sprouts (I have a new recipe in this month’s Today’s Dietitian Mag and will be on my blog soon – stay tuned!). Love that you were inspired by a dish at a restaurant and can’t wait to try with the thai chili sauce! This flavor combo sounds great! These look so delicious and crispy! This looks delicious and simple. I love so many of your recipes that I just found on your site. What a great way to use sprouts! These look SO good!! 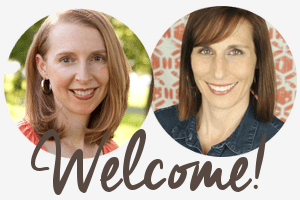 You must – it’s excellent!